Between August 2008 and April 2009 I had the pleasure of working with Euraba Artists & Papermakers at Boggabilla, a small border town in North Western NSW, Australia. Bogga’ is predominantly occupied by people of the Goomeroi indigenous language group and experiences all the suffering one can come to expect on marginal / remote indigenous communities. The nearest big town is Goondiwindi, 9 kms accross the river/border in Queensland but Bogga' is part of the shire surrounding the NSW town of Moree , about 100 kilometers to the south west. A little over 10 years ago,10 Goomeroi women were studying at the local TAFE doing a mix of art practices. Painting on European handmade papers did not sit well with the sensibilities of these students so they enquired of their teacher, Paul West, if it was possible to make their own paper. The seed of that thought flowered into the arts practice that to is today, Eur Úaba Artists & Papermakers. It was while I was there that a shift in consciousness facilitated the elevation of the arts practice as the major focus away from commercial paper making. My focus was to bring out the artist in all the workers employed at Euraba at the time. It was not the beginning of art making there by any means. A strong exhibition program had survived the ever changing management of the company so as to have a stable of galleries willing to show Euraba work. Mentors, advisors, agencies, and funding bodies were all vying for positions to ‘be of assistance’. What the artists wanted was some workshoping in idea development. 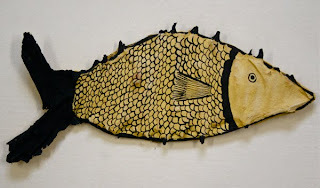 My approach was to work with the artists individually and facilitate recognising strong points in their studio practice and paper skills..
Of the ten founding members two remained as workers while I was there; Auntie May Hinch and Auntie Joy Duncan. This story is about the friendship I formed with Auntie Joy and the development of her arts practice. I wasn’ Ît the man to turn the business around and make everyone in Boggabilla rich but I was there to nurture and develop ideas and skills around innovative creativity. 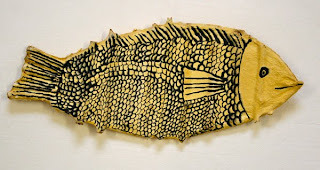 Auntie Joy paints fish and fish nets. For a long time the fish net was her major motif in her work. All on Euraba handmade paper, the mediums Auntie Joy utilised included artist acrylics, pastels, watercolour, pencils, pulp painting and embossing. These two later mediums I began to identify as the signature modality for Euraba Artists. The textures inherent in the major works being produced at Euraba led directly to investigations into sculptural forms. In the early days of 2009 the sculptor in Aunty Joy Duncan was about to explode big-time. A huge convergence of 2 powerful storm fronts flattened most of the vegitation in Boggabilla between Christmas and new year at the end of 2008. Workers spent weeks cleaning up and fixing damage. At our first meeting of 2009 myself and Aunty Joy collected sticks from the storm litter arou Índ the Euraba shed. 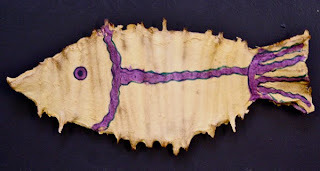 We had been talking previously about going 3D with the 'fish' so after some guidence in how the structure could hold together Aunty Joy formed a fish shape that would become the first "Storm Fish". Storm Fish 1 was build with sticks that still had their bark intact. During the drying process tannin leached into the white cotton pulp giving it a beautiful patina of golden brown edges. Due to concerns around acidity the rest of the work utilised sti Îcks with the bark removed. The technique used by Aunty Joy was to lay out some heavy builders plastic on which to draw the fish shape with the debarked and washed sticks from around the place. Pulp was dribbled quite wet onto the places where the sticks touched until a good covering was achieved. Thicker applications of pulp followed until the shape was complete. Attention was paid to consolidating the edges during drying. A tomato sauce bottle was then used to draw in the details with a contrasting colour pulp slip. The coloured pulps are made by beating coloured rag off-cuts. For the smaller pieces drying took about 2 days before the sculptures could be lifted from the plastic and turned over to keep flat and finish drying. 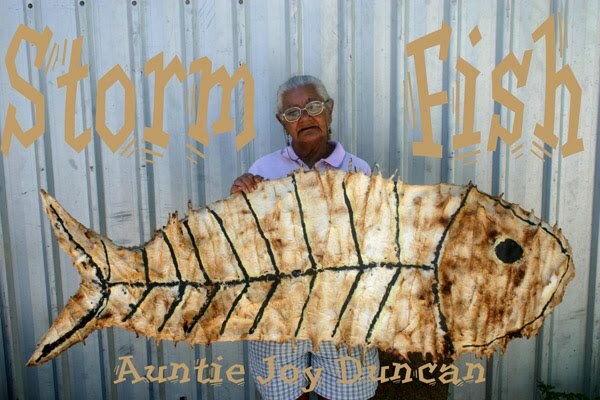 Storm Fish talk about a number of issues for Aunty Joy Duncan. The fish has been her motif of choice for all of her art practice. The fish and the fishing net. Fishing symbolises a history of teaching from generation to generation, passing on culture. "Showing Ì the young ones what our grandparents taught us ... passing it on"
Fishing may well be the only surviving connection to spirit and country that was allowed in the harsh mission days that Aunty Joy survived. Aunty Joy's mom travelled 110kms of dirt road in a cart to give birth at Moree because the local hospital in Goondiwindi did not allow aboriginal women. Language and culture were banned on the missions! Fishing went under the radar as a cultural event and survived as a way of carrying culture in secret. There is more to fishing than fish. Maybe the storm has blown away the net. Aunty Joy Duncan is a proud Goomeroi elder with sensibilities reaching into the soul of her nations traditions. Storm Fish is an exquisite manifestations of a mature and blossoming art practice deserving of all the accolades that can be bestowed upon it. The message is one of moving on into a new collaborative and united existence, embracing all that is pure and just, for all people.